Thallus: crustose, thin or thick, consisting of discrete areoles at first, areoles up to c. 0.4 mm wide, plane or verrucate, often merging to become thick, rimose, plane or rugose surface: light to dark gray-brown, dull; margin: indeterminate; prothallus: lacking; vegetative propagules: absent Apothecia: sessile, frequent, often contiguous, up to 0.6-0.8 mm in diam. disc: dark brown to black, concave to plane thalline margin: concolorous with thallus or dark gray, sometimes with dark flecking, c. 0.1 mm wide, prominent, entire becoming flexuose, persistent; excipular ring: absent thalline exciple: 55-155 µm wide laterally; cortex: 10-20 µm wide; cells: up to 4.5-7 µm wide, pigmented or not; algal cells: up to 9.5-17 µm in diam. ; thalline exciple: 100-150 µm below; cortex: expanded to 20-35 (-70) µm, also cellular proper exciple: hyaline, 1530 µm wide laterally, expanded to 35-50 µm at periphery hymenium: 120-150(-175) µm tall; paraphyses: 2-3.5 µm wide, conglutinate, with apices up to 4.5-6 µm, lightly pigmented and immersed in dispersed pigment forming a red-brown epihymenium; hypothecium: hyaline or light yellow, 40-90 µm thick asci: clavate, 65-100 x 20-35 µm, 4-8-spored ascospores: brown, 1-septate, ellipsoid, type B development, Dirinaria-type, (21-)28.5-30.5(-38) x (9-)13.5-15(-20) µm, lumina angular at first, Physcia-, or Mischoblastia-like, becoming rounded, retaining thick apical wall, frequently inflated at waist, more so in K; torus: absent or narrow; walls: lightly ornamented or not (Fig. 62) Pycnidia: immersed, c. 0.05 mm in diam., ostioles dark brown; conidiophores: type I conidia: bacilliform, 5-6 x c. 1 µm Spot tests: all negative Secondary metabolites: none detected. Substrate and ecology: Rinodina oregana is a species of rainforest communities where it grows on deciduous trees, to elevations of 1950 m World distribution: a North American endemic with an suboceanic distribution pattern (coastal ranges, Cascades, Sierra Nevada with an outlying population in the Washington, Idaho and Montana boundaries region) Sonoran region: a single record from Santa Barbara County, California, represents the southern most limit of its distribution. 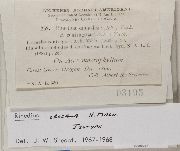 Notes: Rinodina oregana is characterized by its very large, Dirinaria-type spores, and very obvious Type B spore development. It is most similar in general habit to R. badiexcipula but usually has more prominent apothecial margins. This species is distinguished by its significantly smaller, Physcia-type spores, pigmented proper exciple, and crystals of sphaerophorin in the medulla. 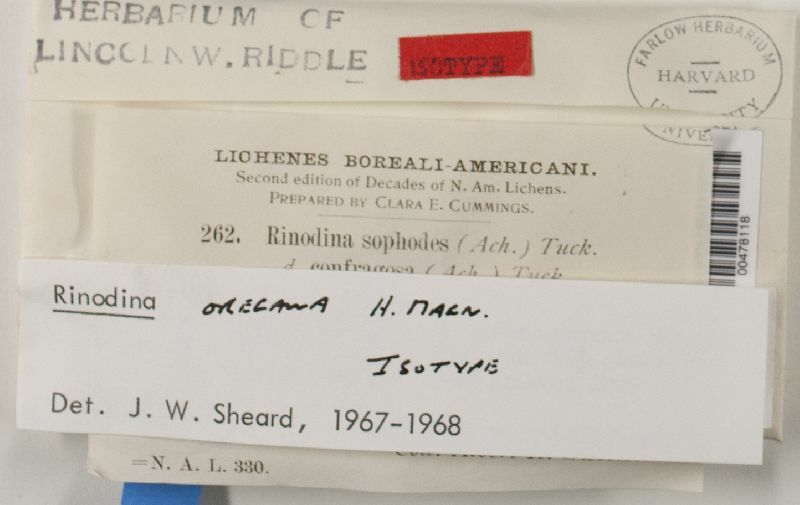 Many specimens identified as R. succedens (Hasse 1913) belong to R. oregana.